Thank you so much for taking time to visit us. Over the last few weeks, we have quite a few new members to the site. Its good time I said hello and introduced this site to you. At Chandoo.org, our goal is simple. We want you to become awesome in Excel. We emphasize the YOU part, because that is what this is all about. You & making you awesome. How does Chandoo.org make you awesome? Simple. We do this using 5 methods. You can get these articles right in to your inbox by joining our free e-mail newsletter. Or you can subscribe to our RSS feed & read the articles in your favorite news reader. When you join our newsletter, you also get a free e-book with 95 excel tips. And yes, grab a helmet. Because this stuff is mind-blowing. We conduct 6 different Excel training programs, all aimed to improve your skills & make you a hero in your office. To date, we have trained more than 3,000 professionals from all parts of the world and made them awesome in Excel. We sell Excel templates for awesome project management & 2 ebooks for learning formulas. These products are crafted with so much passion. More than 7,000 customers have bought these from us and have enhanced their productivity and became heroes in front of their bosses & colleagues. Visit Chandoo.org forums to register, ask questions or learn more. 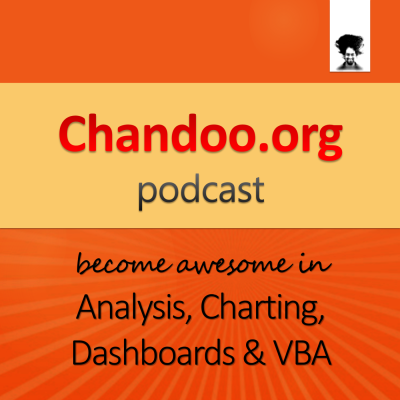 In early 2014, I have launched our podcast show – Chandoo.org Podcast to make you awesome in Analysis, Charting, Dashboards & VBA. Please click here to learn more about our podcast and subscribe. 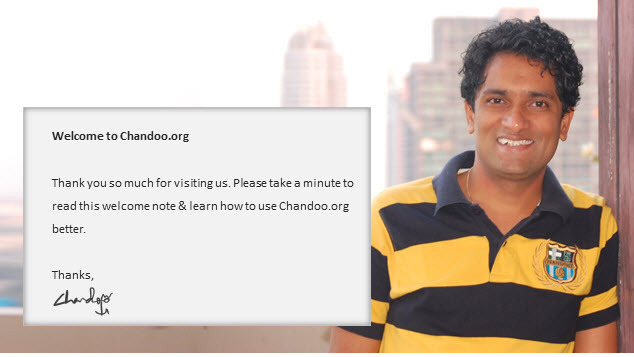 Although started as a personal website back in 2004, after 10 years, Chandoo.org runs on a small employee force of 6 people and massive volunteer community. My name is Purna Duggirala. Chandoo is my nickname. I have used the same for registering this website in 2004. After working for a few years as a business analyst with India’s leading IT company, I quit in April 2010 to make this website my full time work. You can read the back story here. Also, you are welcome to read my adventures in entrepreneurship at Startup Desi. I am happily married to Jo, my college sweetheart and love of life. In September 2009, we became parents to twins – a boy and a girl. Nishanth (boy) & Nakshatra are as naughty, hilarious & lovable as they come. And our life is even more beautiful ever since. There are many people who directly and indirectly contribute to our success. I am just mentioning the key people to keep this short. Hui: contributes voluntarily to our site as a guest author (90 posts, 5,000+ comments), forum member (7,000+ posts). Lives in Perth, Australia with Eva (wife) and kids. Ravindra: manages student admissions to our online courses. Helps me with phone and email answering. Full time employee of Chandoo.org. Lives in Ongole, India. Paramdeep: runs our financial modeling courses. Occasionally writes on chandoo.org. Lives in Delhi, India with wife and son. Joya: helps me transcription of Chandoo.org podcast. Narayan: helps our students by answering their doubts, forum member (9,000+ posts). Pothi: maintains our servers, back-end systems and protects us from alien attacks. Learn more about us & what we use to run this site. This site is awesome because you are awesome. We learn from each other, share what we know, be respectful to others & have a sense of humor. We love to make mistakes and improve every day. Join the newsletter or add this site to RSS newsreader. Each article has a comments section. Make sure you read the comments and respond / ask any questions related to that topic. If you want to explore and learn more, visit archives page and click on a random month. Start reading. Play with downloadable excel files. Modify formulas or break the contents to understand how it works. Tune in to our podcast show. Use navigation links at the bottom of each article to see next & previous artciles. Check out contact details if you want to get in touch with me. On all pages on this site, you can find a search bar at top-right corner. It has auto-complete. Start typing and you will see suggestions. We have both image & text search, so that you can quickly find what you want. All powered by magicians at Google. Today, we have more than 1,000 articles, 20,000 comments, 25,000 forum posts and 50,000 active users of our site. All this means, we have massive information. So navigating & making sense becomes a bit difficult. Worry not, we are working to make it easier for you. Follow the top menu links to quickly access any area of site. You can place pretty much any word next to http://chandoo.org/wp/tag/ and reach the relevant page (example: tag/dashboards, tag/charting, tag/conditional-formatting…). Check out archives to see monthly listing of all articles. Use search to find specific examples or articles you want. If nothing works, post your request on forums or email me (contact details here). While we are not as social as Selena Gomez, we do have a sizable presence on latest web fads. Click on below links to connect with us on your favorite social media platform. Our RSS Feed – add this to your Google home page or Flipboard etc. Thank you so much for visiting our site. I wish you become awesome in not just Excel, but everything else you do.